What do we do if I have bad weather on my wedding day? This is a question I hear from my bride’s all the time. Now I know this picture looks as if it was taken on an absolutely beautiful day but the fact of the matter is that it was taken in November in New York on a day where the temperature was about 40 degrees and the wind was howling out of the northwest at about 30MPH making it feel as if it was more like 30 degrees. Did that keep this couple from getting the beach photos they wanted so badly. Obviously not. They were up to the challenge and I was more than willing to do my part to grant them their wish. I did insist that we do a few posed formal portraits before we headed to the beach just to make sure we had those ‘in the bag" before the bride subjected her hairdo to Mother Nature’s wind gusts. I also made sure to tell the bride to have the tools she needed to touch up her hair style after the trip to the beach. The couple’s limousine was parked about 30 feet away from where this picture was taken…a process which took less than a minute for myself and my skilled photographic assistant. 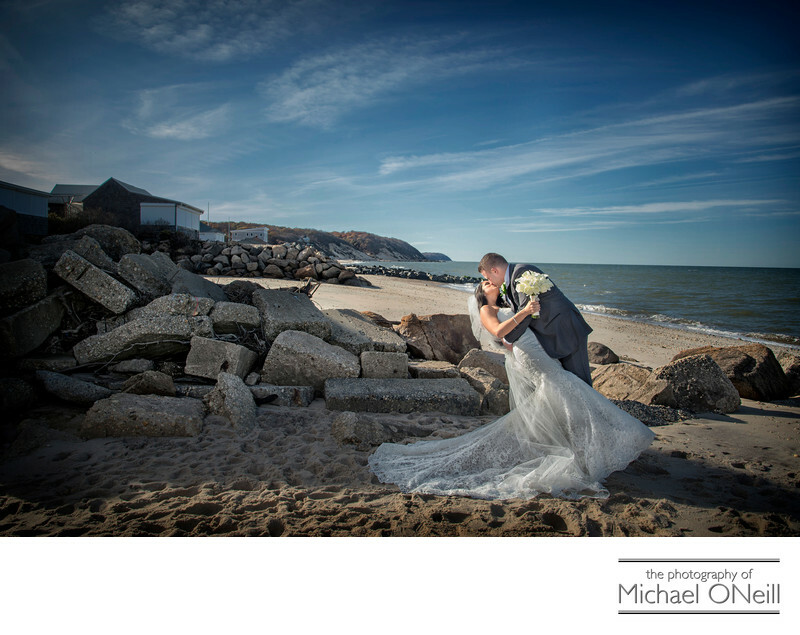 You want beach pictures at your Long Island wedding in November? No problem. I love giving my clients exactly what they’re looking for in their wedding pictures. If it’s important to you it’s my duty to comply with your wishes.